Can I just put this out there that I have been wanting to do this project forever and ever. 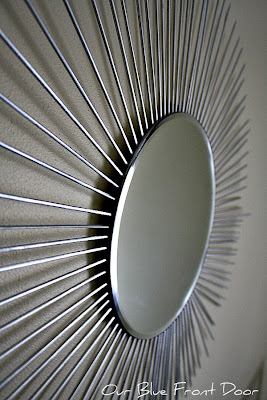 I know there are million Sunburst mirrors out there in blog land so add another and mine makes a million and one! I'm ok with that though. I've admired and grooled over so many on other blogs and finally decided it was time to get one of my own done, enough procrastinating Andrea! 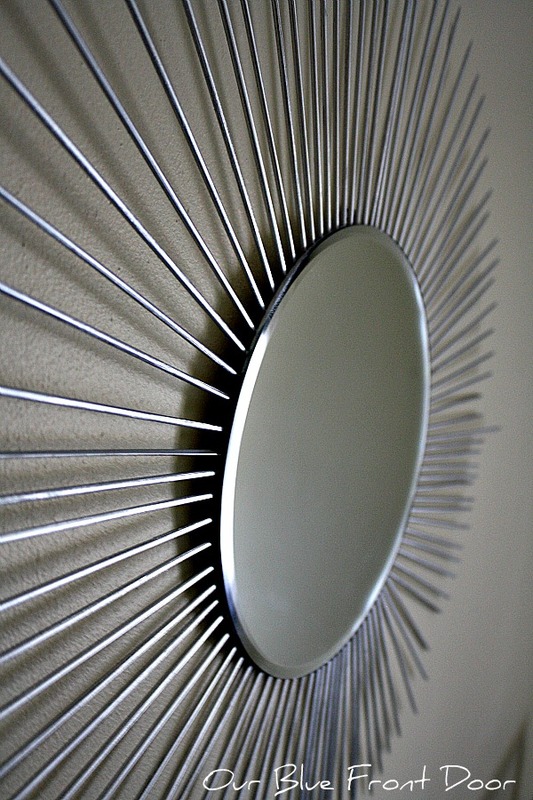 To be honest with you, I had a hard time finding an inexpensive round mirror, crazy I know. I've looked everywhere, at garage sales, thrift stores, and in all of the stores. No luck, so I had to take matters into my own hands and get creative. Catie hung hers in the Master bedroom over her bed. I found a round mirror at Hobby Lobby in the candle area for 50% off so it was around $3 bucks and the wooden skewers came from Walmart. Here's the tricky part, spacing the skewers...umm I didn't and well you'll see. I started with a North, South, East, and West point to have a reference point in glueing down the rest of the skewers. Then I measured the rest of the skewers and marked them so I could try to place them evenly. Key word here I treid...so I glued and glued and fought those awful glue strings, but I won. After I was done glueing everything down I noticed I should've staggered the skewers, oh well what do you do? Since it wasn't orginally a hanging mirror I had to make it one. I used some green floral wire, doubled it up and glued it to the back of the mirror. Used Krylon Metallic because the grey I had on hand wasn't covering the wood and I wasn't going to prime, not doing it, nope. Here's a look at it with a dark background, on my daughter's dresser. It's home over my daughter's bed. My hubby was is worried about the skewers pointing out and if it were to fall off of the wall, huh never thought about that either. Thank you for stopping by. Are you inspired to try your own DIY sunburst mirror? for you to check back with me to see the progress. Hi Andrea! 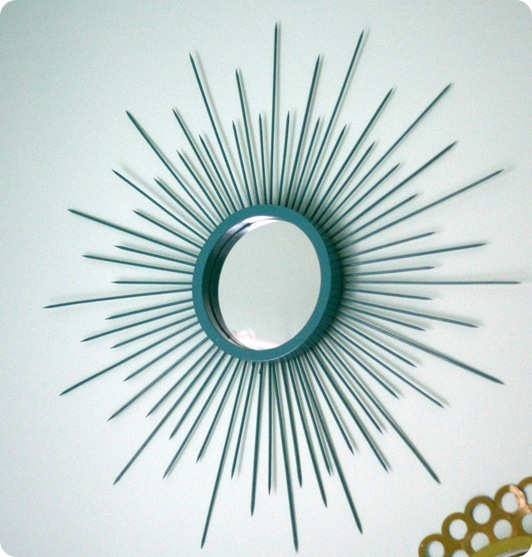 I love your DIY sunburst mirror! It turned out great and I love the thrifty price too. Can't wait to see your daughters finished room! I like it! Looking forward to seeing the changes in your daughter's space. Hope you are having a good weekend! I love your post. Great idea. I found your blog from At The Picket Fence link party. I am a new follower. Love for you to stop by www.homesweetbutterfly.com. hi this is beautiful. There was once in my life that I was so obsessed with sunburst mirror. Yours turned out very nice. Great idea! I think it turned out great! I am visiting from Debbie's Newbie Party. Now a follower too. Blessings! Very cool! I may have to try this one! Oh how creative you are. I have bamboo skewers and have never thought about using them like this. It looks just great and at a great price. Hi Andrea. 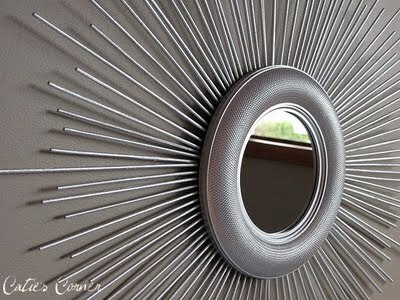 : ) Your mirror turned out great!! Does your daughter love it? Oh and thanks for sharing mine. =) Some body might as well be directing some traffic to my blog since I haven't been. Hope you're doing well. 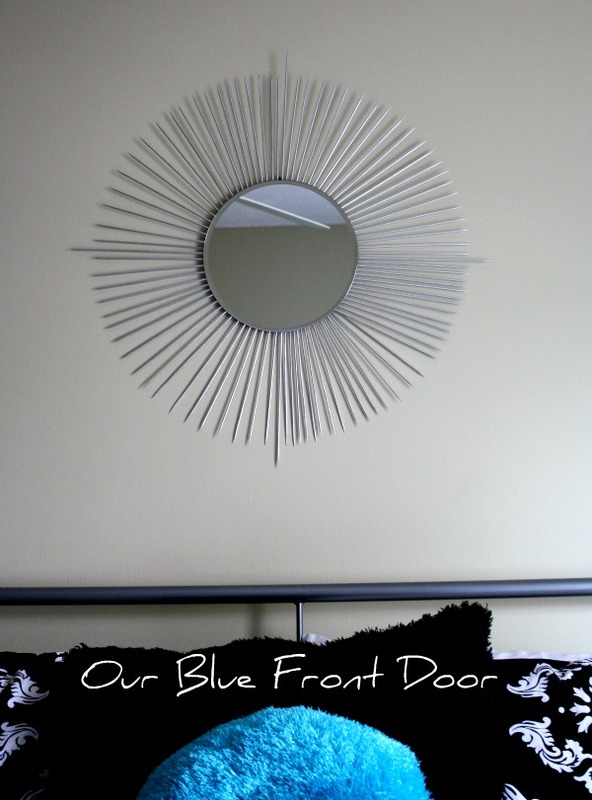 Fun mirror! 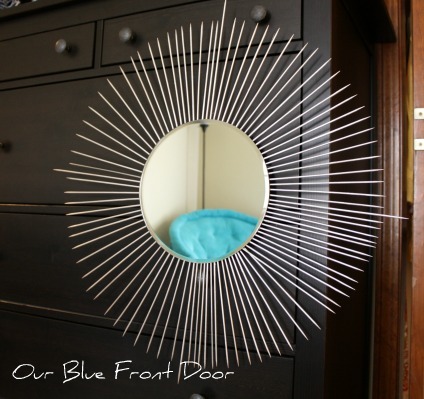 I made a sunburst mirror for our dining room using old silverware. Skewers would have been really appropriate, too. Great idea! Thanks for sharing. I'm hosting my monthly Before Blogging Throwback Thursdays Party and would love for you to drop by and share something you made / did / bought sometime Before Blogging. Can't wait to see what you bring to the party. Hi Andrea! I featured you in my Stalking Thursday. I hope you could stop by. See you. Wow! Look at you go! I never even thought about making this, but yours turned out fabulous!